"This is a great sandwich that I randomly decided to make with some left over pico de gallo from a taco dinner I made the night before. This is vegetarian and makes a tasty lunch. A good side dish would be tomato soup." Mix tomato, onion, cilantro, lime juice, salt, and pepper together in a bowl. Spread butter onto 1 side of each bread slice. Arrange bread, butter-side down, onto a work surface. 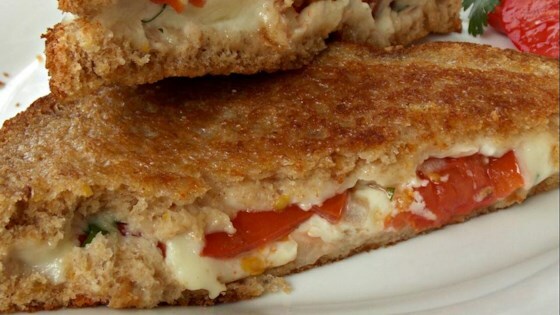 Place 1 slice provolone cheese onto each bread slice and spoon pico de gallo onto 5 of the bread-cheese slices. Top each pico de gallo layer with remaining bread-cheese slices, butter-side up. Heat a skillet over medium heat. Grill each sandwich in the hot skillet until golden brown and cheese is melted, 3 to 4 minutes per side.